“Perception is everything.” — a perceptive someone. Last night's #caedchat was fun. Q5 piqued my curiosity: What are my professional New Year resolutions? First pass, whatever it is share it with others to increase the chance it'll get done. @AustinKleon in Show Your Work! describes a learn>teach cycle. I think it should be more about sharing then remaining in contact through the squiggles. Squiggles are the trial and error we experience (orange in image above) on the way to mastery. 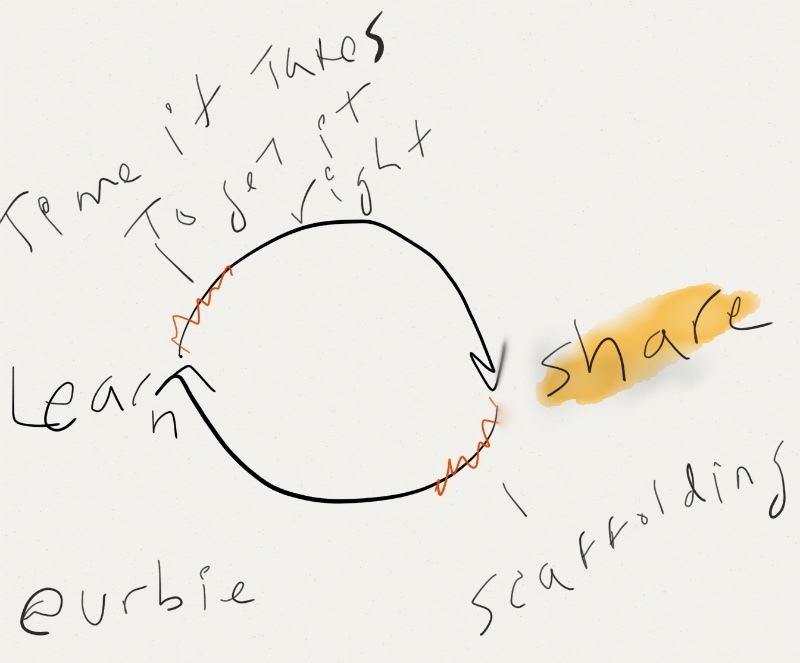 Ideally there are two squiggle moments per Learn>Share cycle: yours just after a learning event and the one others have after you share your know-how. 2015 will be different because of new modes of relationship building. Learn then share through the squiggles. Collaborate via social media and professional associations to learn from diverse perspectives. This entry was posted in #140WC, association for talent development, continuous improvement, educational technology, elearning guild, innovate, instructional design, learning and development, madwriting, positive deviance, professional development, reflection, rhizomatic, social media, storytelling and tagged #140WC, collaborative, design thinking, educational technology, elearning guild, holistic, instructional design, learning experience, madwriting, positive deviance, professional development, rhizomatic, social media, Storytelling by urbie delgado. Bookmark the permalink.